RSS feed for Google+ ? « Adafruit Industries – Makers, hackers, artists, designers and engineers! RSS feed for Google+ ? 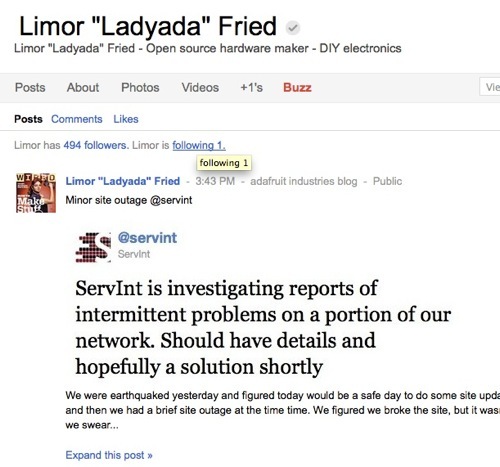 A few people asked if there is a RSS feed for Google+, we do not think there is – but here is an RSS feed for the “Google Buzz Public Activities Feed for Limor “Ladyada” Fried”. I was looking for something like this the other day, I ended up using an unofficial tool at http://plusfeed.appspot.com/. I’m using it as part of a tool aggregating blog/twitter/g+ into a single stream, has been working fine for the last 4 days or so. Limor’s feed would be http://plusfeed.appspot.com/108772200278976934119 (though to be fair, it’s atom and not RSS).